Her hair. Her hair is super long and all one length. Thick locks are offset by a centre parting which gives her look a symmetrical effect. She has been growing her hair for years and looking after her lengths with hydrating shampoos and hair masks which boost her color. This style is bang on-trend and is a perfect example of this year’s statement long hair look. Her look. Fairly laid-back and casual, with minimal color. As the seasons change from spring to summer, it’s difficult to know what to wear each morning due to the unpredictable weather. Today, the heavy clouds and a cool breeze mean our streetstyle pick has decided to opt for a pair of black skinny jeans with a coordinating lightweight sweater. On top, she has thrown an oversized navy coat over her shoulders. As for her footwear choice, dark grey boots tone perfectly with her matching handbag. Tip of the day. Subtle highlights can make your hair look divine and multi-tonal. Why not ask your stylist to pick out the shades they think will suit you best? 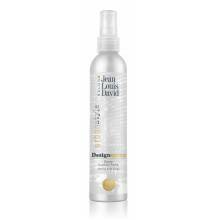 Day-to-day, you should look after your color using products from the Colour Therapy range by Jean Louis David. Your hair color is instantly revived whilst hair looks heavenly and nourished.